What makes our world and the economy tick? Although it is common knowledge that the development of the past 500 years is based on a series of important discoveries that helped shape our modern civilization, we still don’t understand exactly how innovation adds value to the economy and, even more, how to quantify this relationship. 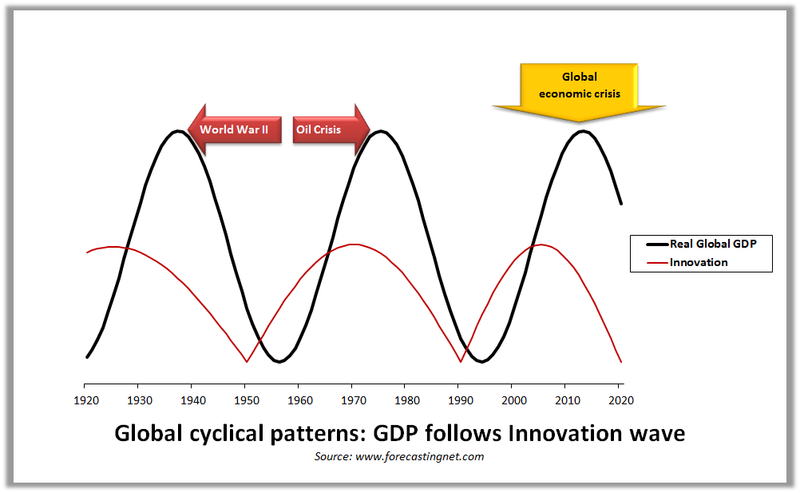 This post will shed some light to the relationship between innovation and economic growth and help us understand how our decisions and efforts today may influence our future! If you want to learn more about what makes our world and the economy tick click here. * Information flow: in the 8th century BC, the Greek alphabet was invented, derived from the earlier Phoenician alphabet (http://en.wikipedia.org/wiki/Greek_alphabet), facilitating information flow by means of the written Greek Language. * Transportation: according to Thucydides, the trireme ship was introduced to Greece by the Corinthians in the late 8th century BC (http://en.wikipedia.org/wiki/Trireme), facilitating transportation and consequently commerce. Even today, the Greek shipping industry, originated in ancient times, ranks high in the world accounting for almost one fifth of the world's tankers and bulk carriers (http://en.wikipedia.org/wiki/Greek_shipping). * Telecommunications: although, advancements in transportation (see Trimeres above) serve as an informal ?postal service? to carry messages and / or packages from one place to another, by definition, there cannot be any advancement in this area, in the sense that we know it today, due to the lack of the appropriate technology. In three out of four factors, namely information flow, transportation, and freedom of speech, there were important advancements that are still considered major breakthroughs in global history and one indirect advancement in telecommunications. All these leading to the wonders of the Greek civilization in science and art that are considered today the prelude to the modern western civilization of our times. To conclude, the presented frameworks works well in ancient times as it works in modern times, unveiling the truly important elements of development throughout history. In addition, in the case of modern western civilization, presented in the post, having a pack of available data to work with, we had the opportunity to also quantify this relationship. * Information flow and telecommunications: these are two areas where both countries made significant advancements, but with a different scope of application. The USSR focused mainly on the espionage part, using a huge team of well hidden spies and high tech equipment to acquire and transfer sensitive information from the US to the USSR. The US, on the other hand, used information and communication technologies to facilitate communication between everyone in or out of the US. Overall, the US scores much better in the Information Flow area, not necessarily due to the use of more advanced technology, but more due to its broadest possible application to the society, business, and everywhere. * Transportation: again this is not just the development of the right technology but also its scope of application. Again, we see advancements in transportation technologies, such as in cars, airplanes, etc., affecting the whole world, including the two countries. However, the USSR chose to use these mainly for military purposes, where the US used them everywhere.. Actually, one of the key investment areas of President Roosevelt?s New Deal just before WWII, was the drastic improvement of the transportation infrastructure of the US, including roads, bridges, etc. Not only that helped the US, along with subsequent War spending, to bring the country out of the Great Depression, following Keynes economic suggestions to FDR, but also gave the US a competitive edge in the transportation and logistics area. * Freedom of speech: The US was established as a democratic state before two centuries and it successfully adheres to this doctrine till our days. Russia, on the other hand, in all its state and political forms, including the USSR, was never a democracy until the last few decades. In all these factors / catalysts of growth, the US scores much higher than the USSR, so, perhaps, it?s not a surprise that the US eventually won the Cold War and is still the dominant economic power in the world, despite its many challenges over the years, including Germany, the USSR, Japan, and more recently China. Based on these thoughts, there weren?t many things that the USSR could do to win the Cold War. The authoritarian and military oriented nature of the state, more or less directed investments in relevant areas of interest, thus limiting the scope of technology usage and knowledge distribution mainly to non-commercial government applications. If the USSR was established from the beginning as a democratic state, with freedom of speech, entrepreneurship, and more rights granted to its citizens, then perhaps, it would have a better chance of winning the Cold War, although I seriously doubt that in this scenario there would be a Cold War to speak of.